YouTube star Miranda Sings (AKA Colleen Ballinger) recently welcomed a baby, Flynn Timothy, into her life. The comedian has rebranded significantly since giving birth — instead of constantly sarcastic, egotistical, and quirky humor, her current Twitter bio just reads "mom." And that's a good thing. Because the Haters Back Off actress is now an advocate for new moms everywhere and a recent viral post she made has started an important conversation on the internet. "I see a lot of moms online who portray a perfect, easy lifestyle," she shared on the platform. "But this is a more realistic version of what motherhood looks like," she continues. "I wish more people would show their reality instead of the most perfect version of themselves online. Cuz the messy stuff is beautiful too." 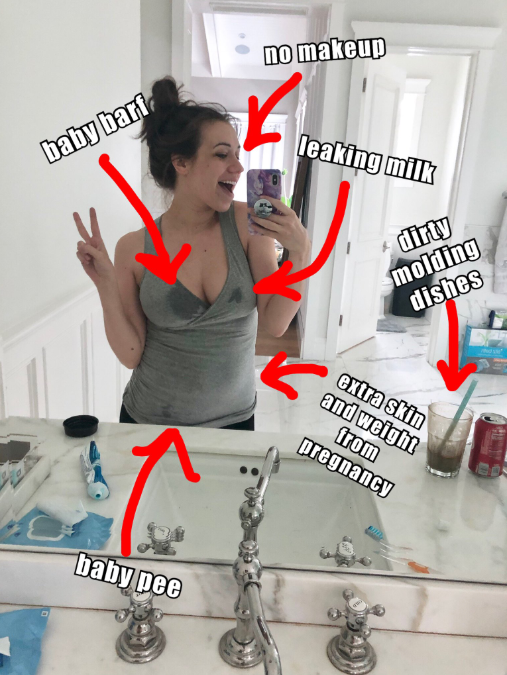 The mirror selfie she shared labeled "baby barf," "leaking milk," "baby pee" and "extra skin and weight from pregnancy" — far from the glamorous keywords you might more readily associate with content posted by online influencers. 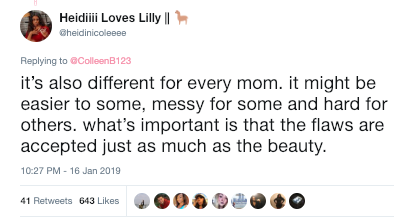 Within a matter of minutes, she had moms everywhere sharing their own imperfect versions of parenthood, and it was gorgeous. "You forgot the hair that probably hasn't been brushed, let alone washed in days. That was always my favorite part of being a new mom lol," wrote one supportive mom in response to Colleen's photo. 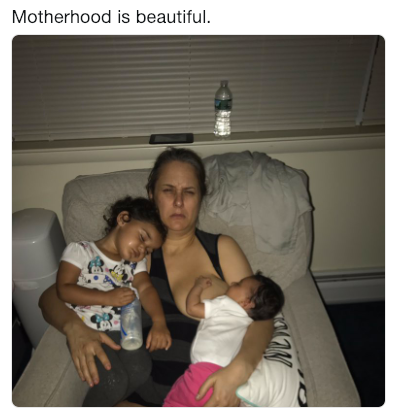 Another added, "I respect you so much for showing the reality of motherhood and showing that even for the people who think it is, not every experience is that way! You and @erik_stocklin are the best parents Flynn could hope for for showing him that it won't always be easy but that that's life!" Even expecting moms are taking comfort in the YouTuber's post. "With me bring pregnant," one writes, "I"m so glad you've been honest about how hard pregnancy can really be because we don't hear how hard it can be! So preach to you for being honest so I wasn't driving myself insane." "It gets better," writes another fan in a caption to her photo. This isn't the first time that Colleen has been a spokesperson for changing the way we present motherhood online. In an interview with People while she was still pregnant, she mentioned that "[pregnancy]’s been so miserable, I feel like people don’t talk enough about how hard it is. I had no idea." Talk about a sentiment women online could relate to. In Colleen's thread, someone else wrote, "College is like motherhood. Your degree is your baby. Sleepless nights to earn the degree. Looking like a hot mess all the time because you may have been lucky enough to get an hour sleep. Forget about finals week, you ain't sleeping at all." 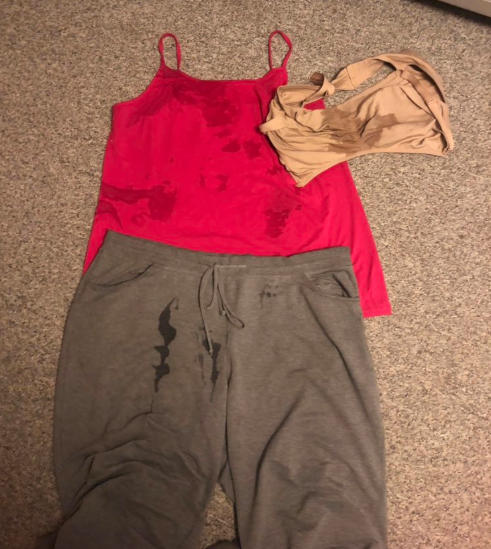 "I took this pic after my son vomited all over me at 3am... I just stripped down and showered lol," wrote another new mom along with the photo above. 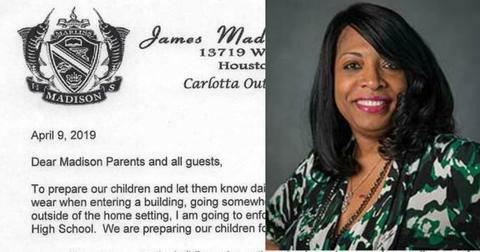 Yet another new mom responded, "Girl, you showered?! Bravo mama! I would've just used a wet wipe and gone back to sleep lol. My son is 3 weeks old tomorrow, I'm sleep deprived, showering can wait til the morning." 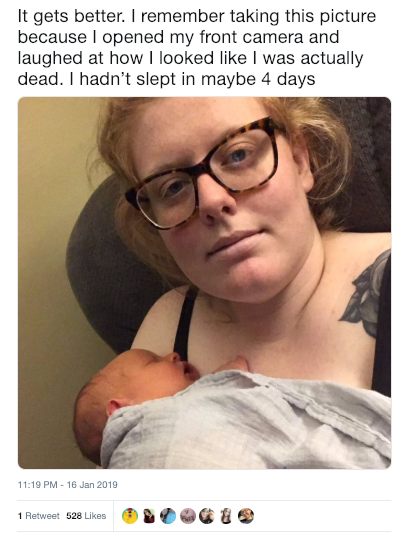 Other women sttressed that it's "different for every mom," I guess because some of them really manage to make themselves look like IRL Snapchat filters within the first few hours of giving birth. Hey, there's all kinds of people in the world. 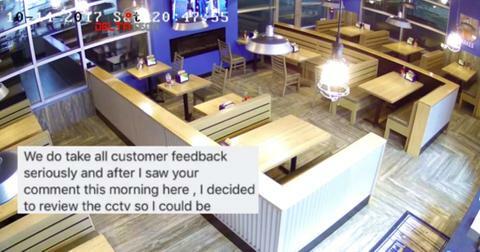 Her perspective seems to have struck a lot of cords because other women are cheering her on in response. "Yes!" writes one, "I was looking at this post feeling a bit crappy for some reason. This wasn't my reality. Thankfully, I had it easy. But it helped GREATLY that I was everyone's go-to babysitter growing up. No hate! Just saying, this wasn't my reality, and isn't with, now, two kids." Another responded, "Ladies they just want a pat on the back and to be ahead in the make-believe competition of 'motherhood'." Well, it seems even a super motivational and positive thread on the hardships of motherhood isn;t enough to make the "haters back off." Others reflected on what they do and don't share on social media, and why. One explained, "Part of this is that you don't want to burden others with the hard things, nor be reminded of them. I don't delete many 'bad pictures,' I just only want to share the good times because I want to remember it that way." 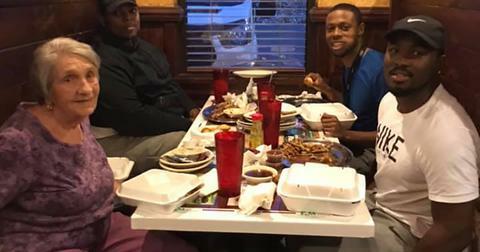 Nevertheless, some say they've been showing off their messiness long before Colleen's viral tweet. "I show my reality all the time..." one begins. "Motherhood is not easy... ALL MOMS wear dark-circled eyes, milk-stained shirts (of course for breastfeeders like me), comfy pants, baggy shirts, and ratted hair. PROUD!!!!" Hopefully, Colleen's bold move will get more moms to show this side of motherhood that's often hidden from the public eye. Congratulations and thank you to new moms everywhere for doing the good work.